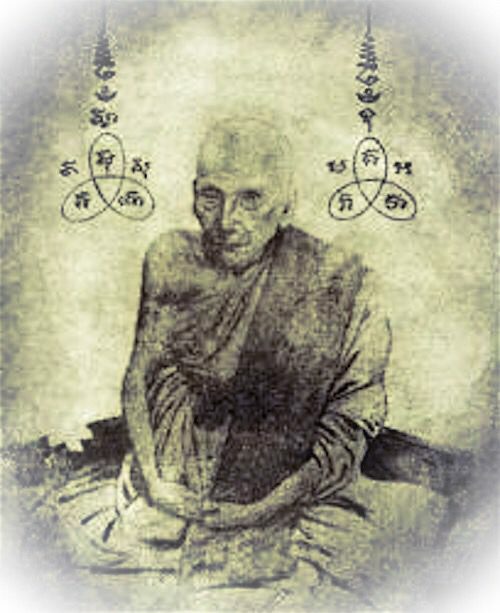 Luang Por Kong was a very revered Guru master of Chonburi renowned for his Powerful Magical Wicha. Luang Por Plad Kong was ordained as a Bhikkhu (Buddhist Monk) at the age of 26 Years Old after serving 5 years in the Army. he was extremely diligent in his studies of Dhamma and Vinaya, and became a Genius in the subject. He also worked hard at Vipassana Kammathana practice and became a great Adept with special abilities. He also worked hard for various Charitable and Meritorious Projects during his life, and always taught the Local Folk to develop the Moral Precepts and Virtues. He also restored and developed the temple of Wat Bang Lamung constantly during his time, and would repair any damages immediately keeping good maintenance of the temple. He was constantly looking to improve conditions and make all necessities available for correct Dhamma practice. His Death was a very Miraculous occasion; As the devotees attended him at Wat bang Lamung, and one Looksit was massaging his aching bones and limbs, Luang Por passed away without a sound and no one even noticed until a while later. Just as they had noticed his passing, a strange thing happened; A Lunar Eclipse! The good deeds of Luang Por Kong and the improvements he made to the community are still noticeable today at the Temple. Luang Por Kong Passed in 2492 BE at the age of 87 Years Old. Amulets of LP Plad Kong are in very small numbers, and very rare. they are mostly to be found in the showcases of serious collectors, and Devotees of the late LP Kong, and the Folk of Chonburi.